My dad’s Canada | Blog? What blog? “Before coming to Canada, I had only very vague idea about this northern country. In our high school Geography textbook (in Taiwan in the 1950’s), Canada was described as a colony of GB, the second largest country (to then the Soviet Union) in the world, very cold, rich in natural resources, agricultural, and very civilized. After graduating from the Taiwan University with a bachelor degree in agriculture, I decided to continue my graduate study in the areas of botany. I applied to several universities in the US and Canada where the research in botany were advanced. Among those universities that offered me some kind of financial assist, which was essential for me being able to study abroad, the Apiculture Department of University of Guelph was the one that I chose for the reasons that I’d be able to continue my study in both botany and insect physiology; the university is located in the famous Ontario (the Chinese translation of the name is safe and large); and the financial assist was more than satisfactory. When I applied the university was still under the name of Ontario Agriculture College under the University of Toronto. By the time I was accepted, the institute was changed to Federal College, and when I arrived in 1964, it was officially the University of Guelph. I studied very hard under the guidance of several excellent professors, specially my supervisor, Dr. R. Shuel, and obtained my master degree in Science in 1967, and my PhD degree in 1971. 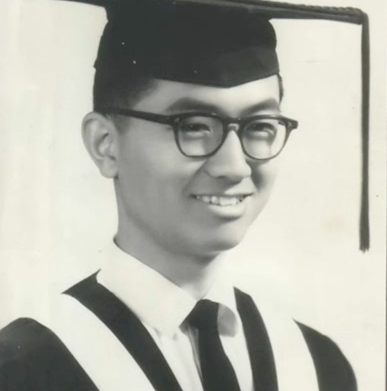 I became a landed immigrant in 1965 and a citizen in 1967 because the immigration officer in Guelph hated to see my ugly face (his words) and encouraged me to stay in Canada after the country has invested so much time and money on me. I hope that I did not disappoint that immigration officer by becoming a public servant and working in a federal government department after completing my education. Now after working there for 27 years, I’ve retired and enjoyed the rest of my life here. I married and became the father of two Canadian daughters, and now a grandfather of three Canadian grandchildren. I’ve lived in Canada for 48 years – more than a half of my time. Every year our house is only one of the few houses on our street to fly a Maple Leaf flag on Canada Day. I am living like a true Canadian (drinking beers and watching hockey games) though I have never forgotten my Chinese cultural background. I’m not a very ambitious person but very proud to be a Canadian and I’m very sure that I’ll not live in any other country for the rest of life.